Be the first to share your favorite memory, photo or story of Edgar. This memorial page is dedicated for family, friends and future generations to celebrate the life of their loved one. 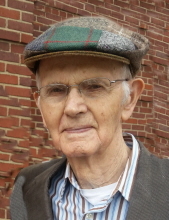 Edgar Eugene Rogers, 91, of Crab Orchard, passed away Tuesday, February 12, 2019. He was the loving and faithful husband of Joyce (Smith) Rogers whom he married on December 31, 1950. Edgar was born in Crab Orchard, on October 8, 1927. He was a son of the late Lewis Graden and Nora Ann (Brown) Rogers. Edgar had worked as a farmer and was retired from Penn Ventilator. He was a faithful member of the Mt. Zion Church of Christ and was a veteran of the United States Army. Place of Burial: Mt. Zion Church of Christ Cemetery with military honors by the Caswell Saufley American Legion Post # 18 of Stanford. Visitation will be after 5 PM on Friday, February 15, 2019 at McKnight Funeral Home and after 11am on Saturday until funeral time at Mt. Zion Church of Christ. To send flowers or a remembrance gift to the family of Edgar Eugene Rogers, please visit our Tribute Store. "Email Address" would like to share the life celebration of Edgar Eugene Rogers. Click on the "link" to go to share a favorite memory or leave a condolence message for the family.